"...by the middle of November, they had a $20 million per year left fielder who wanted out, an $11 million shortstop so offended by the team's offer for an extension that his agent had told the Red Sox to trade him, and in Pedro Martinez, a $17.5 million per year starting pitcher who was already warning the team that if they didn't sign him to an extension before the season began, he wouldn't even speak with them once it was over. In the midst of all this, the Red Sox decided to pursue one of the most outspoken pitchers in all of baseball." Any baseball fan with a modicum of intelligence (and who hasn't been under a rock for the last three years) should be able to deduce that this quote refers to the Boston Red Sox, in the autumn of 2003. In the wake of yet another heartbreaking defeat at the hands of the Hated Yankees(TM), the Sawx threw caution to the wind, stockpiled the best talent available, and set out to win themselves the championship that had eluded the franchise for 86 long years. 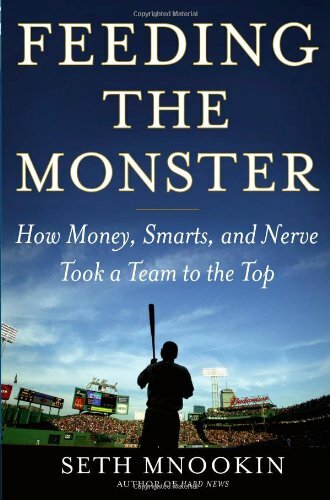 Author Seth Mnookin, in his mnew (sorry, I couldn't help mnyself) book Feeding the Monster , chronicles not just how "Money, Smarts and Nerve Took a Team to the Top", as the subtitle indicates, but how ignorance, cowardice, mistrust, mismanagement and bad luck had kept that team down for decades at a time.